This hand lettered Valentine’s Day cut file is perfect for so many different projects. Place it on a shirt, on a mug or in a frame. It makes a great gift for your gal pals. Usually, at this time each year, I’m making some cute printable valentines for my kids to take to school. This year, I decided to make something for the adults. Specifically for all the single ladies out there (cue Beyonce). Heck, this applies even if you aren’t single. I’m declaring this hand lettered Valentine’s Day cut file appropriate for every woman. 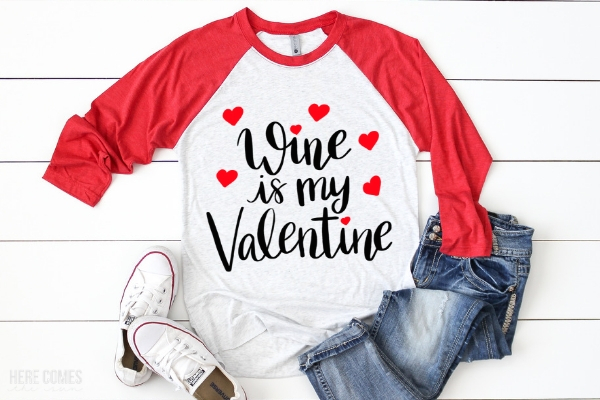 Wear it proudly on a shirt or use it to make some customized wine glasses for your girlfriends. Sometimes a night in with a glass of wine is just what I need. Don’t get me wrong… I love going out to a fancy dinner but sometimes I just want to sit on the couch, sip my wine and be left alone. I know you all can relate. If you are not familiar with cut files, you may want to first read this post about how to use SVG files. SVG stands for scalable vector graphic and it is the format that I use to make most of my cut files. 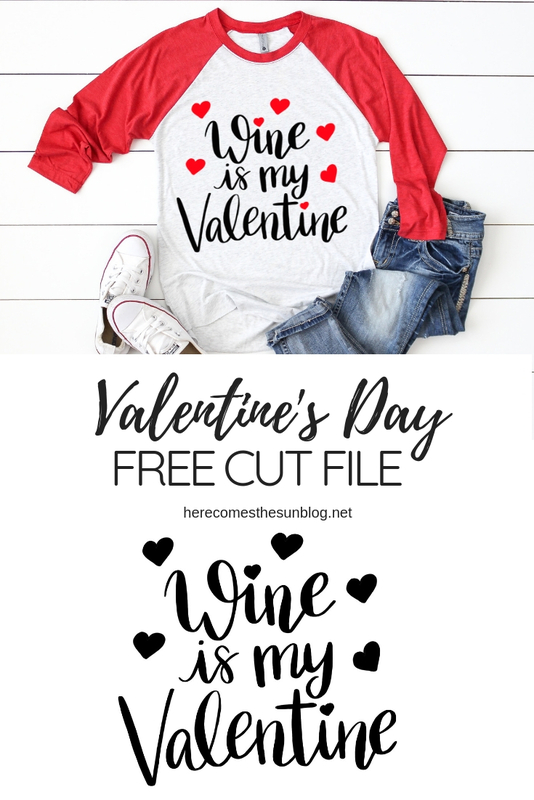 I’m going to go through how to use this hand lettered Valentine’s Day cut file to make a shirt using heat transfer vinyl but you can also use it with regular vinyl to make projects such as mugs and wine glasses. Using your Silhouette or Cricut, cut out the file heat transfer vinyl. Make sure to mirror the cut file before cutting. My favorite heat transfer vinyl (HTV) is Siser Easyweed. I find that it sticks really well and holds up well in the wash. I like to use this brand of HTV for all my projects. If you want your design to look like mine, you will have to cut out multiple colors of vinyl. Once the file is cut, weed out the excess vinyl with your weeding tools. The great thing about HTV is that you don’t need transfer tape. The vinyl is stuck to a carrier sheet so all you do is flip it over and iron/heat press it to your shirt. Center your vinyl design onto the shirt and place a pressing mat inside the shirt. Set the Cricut Easy Press to 315 degrees and 30 seconds. Place the Easy Press it on the design for 30 seconds. The Easy Press will beep when the time is up. Remove the Easy Press from the shirt and peel off the carrier sheet while it is still warm. If using an iron, set your iron to the cotton setting and turn the steam off. Place a piece of parchment paper over your design and iron for 20 seconds. If your design is larger than the iron, iron one portion of the design at a time. Check to see if the design has adhered to the shirt. If it has not, replace the parchment paper and iron again. I highly recommend using an Easy Press because it heats more evenly than an iron and you will get better results. First, download the file and save it to your computer. If it is a zip file, unzip it. Can this file be used with a Cricut? Yes. Any SVG file can be used in Cricut Design Space. I do not own a Cricut so I do not know the exact steps on how to cut the file with a Cricut but Cori from Hey Let’s Make Stuff has lots of Cricut tutorials that you can follow.